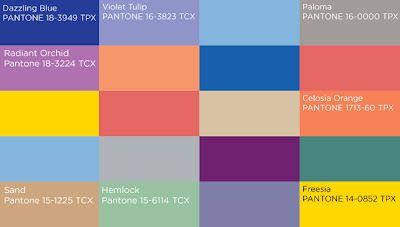 Pantone Top Colors Spring 2014 - Be Glossy In and Out! Pantone is giving us a glimpse into the dominating colors we’ll see in the next year. You’ll find many shades of blue on the list, but the Dazzling Blue ranks number one, being the color of 2014. Dazzling Blue is the color of Facebook logo. So, it will be mandatory for all of us to have this color in our wardrobes. Violet Tulip came in second and Radiant Orchid landed third. The other 2014`s colors in the list are: Celosia Orange, Hemlock, Freesia, Paloma and Sand. Leatrice Eiseman, Pantone Color Institute’s executive director, tells WWD that the season’s colors are all about maintaining equilibrium. “The world still needs the stability of soft neutrals but we’re not just talking about gray, beige, and taupe.” All you have to do to reach this perfect color balance is mix your favorite bold colors with a little gray and tan. Don’t hesitate to redefine what neutral means to you. I am not so enthusiastic about the blue shades as they are not my favs, but I am very glad about the purple ones, which I started to use even from this year. What you believe of the the colors of 2014? Which ones you like and suit you? These colours are so pretty! I love the blue. Δεν έχω πρόβλημα να δοκιμάζω οποιαδήποτε απόχρωση!